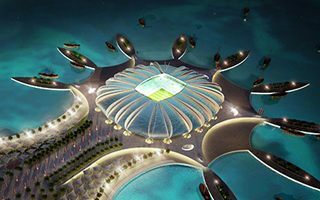 When Qatar submitted their bid to FIFA in 2010, the candidate nation promised to spread the 2022 World Cup as much as possible, despite obvious concentration around Doha. Al Shamal, Al Khor and Al Wakrah were the most distant locations pointed out, though only one of them is more than 50km away from the capital. But, as it was confirmed in the spring of 2013, FIFA agreed to cut back the list of host venues from 12 to 8-10. Final number and location of host venues should be established by the Supreme Committee for Delivery and Legacy (SCDL) by the end of 2014. In March 2015 FIFA will evaluate the proposal and establish the tournament stadiums. So where’s the problem? Even without the two latest additions, the 2022 World Cup was unprecedentedly congested and now it gets even worse. The new Qatar Sports Club Stadium would stand only over 3km west from the Doha Port Stadium. And the second newest addition, at Hamad Airport, would also be 3km from the Port Stadium, but to the east. These closest stadiums join already controversial pairs, like Khalifa Stadium and Sports City Stadium, planned under 4km apart. Similar distance would divide Al Gharafa Stadium and Education City Stadium. With such a tight map the stadia lying just beyond Doha’s city limits (Al Rayyan, Al Wakrah, Al Khor, Lusail) seem like distant ones, even if the furthest of Doha’s satellite stadiums is just over 30km away. The only “remote” one is the Al Shamal Stadium (over 70km north), though at this point it’s not among those certain to be built.